​Are You Ready to do What GOD has told you to DO? Are you ready for RESTORATION? ARE YOU CALLED TO MINISTER? Do you have a heart to see people restored to the throne of God? Do you have a ministry in the United States? Do you minister in another country other than the U.S.? Do you have a para-church ministry? i.e. nursing home ministry, jail ministry, street evangelism, youth minister, internet ministry, deliverance ministry, lay worker in the local church; Do you pastor a church? Do you want a prayer covering that reaches around the globe? 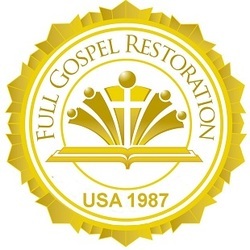 Then we invite you to become credentialed with Full Gospel Restoration Ministers and Churches. to be a part of restoring ministers, laity and every day people back to the throne of God. Too often we see people who use to be in church but because of being hurt by someone or losing their joy, they are no longer. To leave a person in a broken or burnt out state is a great sin. (Luke 10: 33-34) In the first year we went from 8 ministers to 200. The Lord showed Bishop Tice that the organization would have 200 people by the end of the first year. Eleven months from the beginning, FGRMC had 50 ministers (but that was not what God had shown him). During that last month Bishop Tice received a letter from the Philippines from Rev. Ernesto Balili requesting a covering from FGRMC. He brought with him 150 ministers. Truly, the miracle hand of God was working then and is still working today. Today we equip and set forth men and women of God to go forth into all the world as our Lord commanded us to do. Restoration: (Gal 6:1 KJV) Brethren, if a man a be overtaken in a fault, ye which are spiritual, restore such an one in the spirit of meekness; lest thou also be tempted. Service: (Mat 25:40 KJV) And the King shall answer and say unto them, Verily I say unto you, Inasmuch as you have done it unto the least of these My brethren, you have done it unto Me. Evangelism: (Mat 28:19,20KJV) Go you therefore, and teach all nations, baptizing them in the name of the Father, and of the Son, and of the Holy Ghost: Teaching them to observe all things whatsoever I have commanded you: and, lo, I am with you always, even unto the end of the world. Amen. Helps: (Luke 22:31,32 KJV) And the Lord said, Simon, Simon, behold, Satan hath desired to have you, that he may sift you as wheat: But I have prayed for you, that your faith fail not: and when you are converted, strengthen your brethren. · The Bible is the inspired and only infallible and authoritative written Word of God. · There is one God, eternally existent in three persons: God the Father, God the Son, and God the Holy Spirit. · In the deity of our Lord Jesus Christ, in His virgin birth, in His sinless life, in His Miracles, in His vicarious and atoning death, in His bodily resurrection, in His ascension to the right hand of the Father, and in His personal future return to earth in power and glory to rule a thousand years. · In the blessed hope - the carrying away of the Church at Christ's coming. · The only means of being cleansed from sin is through repentance and faith in the precious blood of Christ. · Regeneration by the Holy Spirit is essential for salvation. · In water baptism by immersion. · The redemptive work of Christ on the cross provides healing of the human body in answer to believing prayer. · In the baptism of the Holy Spirit and Fire, given to believers who ask for it. · In the sanctifying power of the Holy Spirit by whose indwelling the Christian is able to live a holy life. · In the resurrection of both the saved and the lost, the one to everlasting life and the other to everlasting damnation. If you believe in the work of restoring all the people back to the throne of God, then you can assist with your prayers and financial support. You can make your donation through Pay Pal or by mailing to the address below. We thank you in advance for helping us restore the broken, burnt out and fallen back to the loving arms of Jesus Christ and the body of Christ.